APSDS 5.0 draws on the features that are in HIPAVE 5.0 and CIRCLY 5.1. With this new calibration, pavement thicknesses determined by APSDS 5.0 are significantly less than those obtained using our previous calibration and the FAA design software, FAARFIELD. Earlier versions of APSDS modelled aircraft with more than one main gear on each side of the aircraft (such as the Boeing 747) as two separate load cases. APSDS 5.0 models these aircraft as a single entity, making it easier to define traffic spectrums that include such aircraft. APSDS 5.0 implements the ‘reservoir’ method, as used in bridge design to handle complex loadings, to consistently calculate the damage from overlapping strain pulses due to multi-axle landing gears. Earlier APSDS versions could only calculate damage based on two extremes: multiple distinct short pulses resulting from each axle (for shallow depths) and a single longer pulse that reflects the overall loading on the gear (for large depths). Like APSDS 4.0, APSDS 5.0 accumulates the contribution from each loading in the traffic spectrum at each analysis point by using Miner’s hypothesis. Here there is a data point for each combination of aircraft model and gross weight. These graphs let you check the sensitivity of designs to assumptions made about the gross weight distributions. APSDS 5.0 comes with a standard aircraft library – that can be automatically updated from our webserver. APSDS 5.0 extends the lateral vehicle wander concept used in earlier versions of APSDS to include the capability of letting the degree of wander vary with each aircraft model in the traffic mix. A Parametric Analysis feature can loop through a range of thicknesses for one or two layers, while simultaneously designing the thickness of another layer. This feature will optimise up to three layers. Combining this with a Cost Analysis feature, allows for fine-tuning of layer thicknesses to minimize construction and maintenance costs. For example, for the pavement structure shown below, you can automatically determine the thicknesses of the Base and Subbase that will minimize the total cost. APSDS 5.0 uses its own “built-in” Graphics Engine to create on-screen graphics almost instantaneously. The graphics can be customized, exported and printed. In most cases, results for different layers or Z-depths in a layered system can be created without re-analysing the system. You can also copy the graph to the clipboard and then paste it into another application such as Microsoft Word or Powerpoint. Numerical values can also be exported via the clipboard. 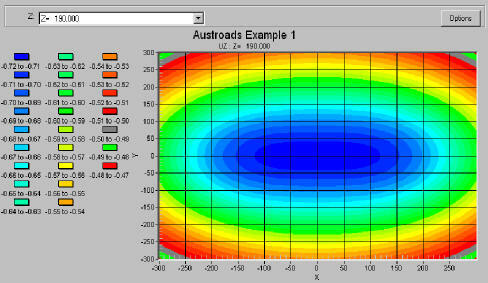 APSDS 5.0 lets you duplicate a Layered System or Traffic Spectrum. For example, sometimes you may want to create a Layered System that is similar to an existing one. The Duplicate function lets you duplicate an existing Layered System. Then you can change the settings that need to be different.